This past weekend, my friend and colleague, Justin, invited me, Lincoln's and my training mentor, Chip, and Chip's awesome French Britts to go exploring in his native land in West Virginia for some late season grouse hunting. Grouse, the "King of the Game Birds," have earned their reputation and moniker not just on the deliciousness of their meat and their beauty (and their fabulous tails), but also, in recent years at least, because of their diminished numbers and the relative rarity of a bird hunter actually bagging one of these incredible birds on any given trip. And so (spoiler alert! ), my first grouse hunting sojourn did not meet with success, at least in terms of birds brought to bag. But, I can honestly say that did precious little to diminish the joy of being in the gorgeous mountains we put under foot, seeing the dogs work, and getting to know good friends even better. On those counts, the trip was an enormous success. It will also be the experience and research foundation for our future ventures into those same mountains in search of the King. I will still claim tight to my status as an upland newbie to hope that it is neither faux pas to disclose anything about our location nor to not say enough, so I'll tread carefully in saying that we were somewhere in West Virginia and that we hunted two locations over a total of about ten miles, one location just shy of a mile high and the lower one at around 2600 ft. The fact that I feel protective of the locations of what were for us completely unproductive grouse sites on the day in question is perhaps testament to both the rarity of finding grouse in many places and to the harsh conditions that added to the challenge of what would already be considered a tough get this late in the season. We started the day at 1* fahrenheit at the highest elevation and ended the day still below freezing at the lowest elevation. We were also met with freshly fallen snow, which dramatically increased the beauty of our huntscape but which just as dramatically lowered our chances of having the dogs find grouse as very cold temps together with very low humidity and fresh snow cover provide among the worst possible scenting conditions for bird dogs. We knew the areas we covered contained grouse just this year, because Justin had encountered several by happenstance when he was out there deer hunting months before. But, cold and snowy grouse hunting has its own rules, unique to the situation and very distinct from hunting them earlier in the season when it's warmer. We did get some action (though not fully obvious points) around a few logs. We likely should have let the dogs pursue their interest in the logs more as the grouse were likely holed up inside them in the super cold temps. Even still, we found precious little, if any, food sources for them at the highest elevation nor any bird tracks that we could discern. 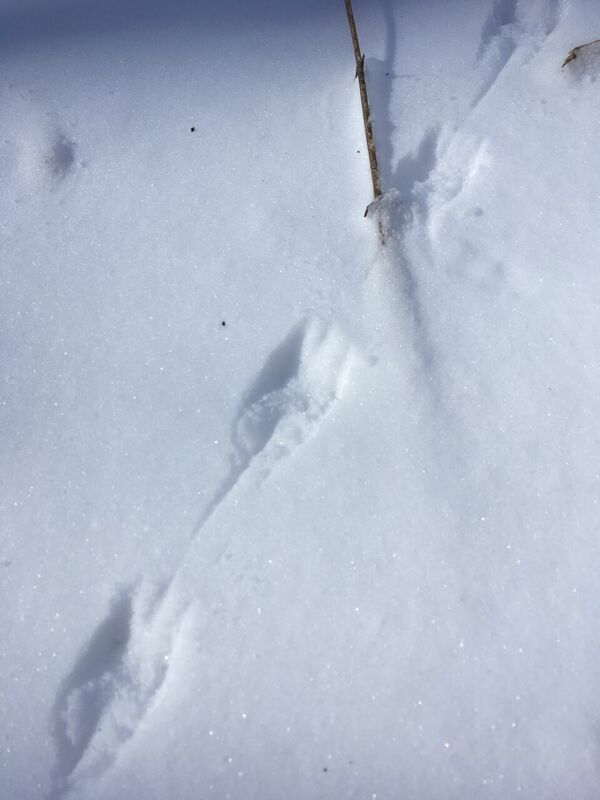 We found deer and bear tracks, and we spotted some deer, but the tracks we found which we first thought might be birds were almost certainly mouse tracks. We did not spot any tracks all day which might have been convincing candidates for grouse tracks. A word here about Chip's dogs, French Brittanys, as distinct from Lincoln's American Brittany breed. French Brittanys are the smallest pointing breed and are terrific versatile hunters. American Brittanys have been bred since their introduction in the United States to range further and wider, consistent with many of the hunting landscapes here, as compared to the most common French hunting landscapes. It is likely they were at least sometimes bred with larger-ranging breeds like English Pointers to achieve that desired change. Theories about the development of both breeds are controversial, and you can read more about the differences and development theories in many places. Here's just one, but I'd argue that you'd need to read a lot to get a well-rounded view of the most common differences and the theories of breed development which led to the slight, yet important, distinctions between these two closely-related breeds. Whether you are reading essays, articles, research, or listening to a fellow hunter wax eloquent about either breed, it would be wise to both keep an open mind and also a healthy degree of skepticism about whether or not you're getting a depiction of all these things based on personal bias and breed partisanship. In general, French Brittanys are arguably much closer to the French and American Brittanys' common ancestor, which developed in the Brittany province of France between the 17th and 19th centuries, as the result of incidental and unplanned breedings between English bird dogs quarantined from England between English gentry hunting seasons spent in France and the smaller spaniels used during that time in that area of France. French Brittanys tend to be smaller and closer-working while their American cousins tend to be larger and wider-ranging. French Brittanys are most often roan pattern (white areas thoroughly mixed with pigmented hair) and can be predominately orange and white, black and white or tricolor. American Brittanys are more often orange and clear (white patches that have no intermingling secondary color or with just tiny clumps of pigmented hair called "ticking," usually around the snout and on the front legs), liver and clear, orange roan, liver roan or tricolor. Black is a disqualifying color for breed-standard American Brittanys, whether in the nose or coat, while it is a recognized and acceptable color for breed-standard French Brittanys. For close, thick, and mountainous grouse cover, it's hard to argue that Brittanys aren't more suited to the task than other bird dogs nor that French Brittanys aren't perhaps the best suited due to their smaller size and close working nature. Chip's dogs (all from top blood lines and either having achieved, or on their way to achieving, titles) certainly are and I can vouch that watching them work is a pure pleasure to behold, whether they are methodically working tough and very cold grouse woods or in easy, early-autumn fields in search of quail. Anybody who won't admit when challenged that their choice for "best bird dog" isn't objective but is instead very personal and heavily influenced by their own dog or dogs isn't really worth even a minute of your time and consideration. So, I'll readily admit that it is the mountain of bias that is the result of loving and raising Lincoln which has cemented the American Brittany as my own personal choice for all-around Best Bird Dog. But, I find myself taken by each and every one of the bird dog breeds and I can certainly say French Brittanys compete in my heart for the title of very close second from spending so much time around Chip's incredible dogs. On this trip, we brought all six of them: the elders, Lola and Antar, the super-sweet black and white Jamari, the coming-into-their-prime field trial stars, Kona and Skylar, and the newest addition to their pack, the little spit-fire Nova, who already is exhibiting the vast potential she has within her from her impeccable bloodline that will be coaxed out daily under Chip's expert care and training. Every one of them got some time with noses to ground and excited, wiggly butts in the air, and we had an absolute blast watching them work all day long, each of them indefatigable when the prospect of finding birds and searching new terrain was laid out before them. We ended the day in the lower terrain, in an absolutely stunning field at the base of a state forest. While the terrain there had many more potential food sources for the grouse and the forest was a good mix of high and low cover, as the setting sun finally made an appearance under the clouds and the shadows stretched long, we began to realize that our day wouldn't include the smell of gun powder nor a grouse brought to hand by a very deserving dog. But, we also knew we'd be back and that this trip was but the first research expedition into these particular woods and in these particular mountains, our drive for the King of the Game Birds only stoked more by the mysterious elusiveness of our quarry. Struck by the pure beauty of waning light that shot through the dark forest and coated the field in front of it with an almost celestial glow, in the company of such a fine pack of canines and humans, we had found the magic in Chip's oft-repeated and wise maxim that "sometimes, wild bird hunting is just a walk in the woods with dogs and friends." And what a splendid walk it was.